In October 1962 the existence of the world was threatened. Experts examining photographs of Cuba taken by U2 spy planes saw what they believed to be evidence that the Russians were building nuclear missile sites in Cuba. It was the beginning of a confrontation that took the world to the brink of a nuclear holocaust. In 1962, the Cold War was at its coldest. The Russians had built the Berlin Wall the previous year. Kennedy who had been elected because he promised to get tough with the Communists felt that Khrushchev had got one over on him at the Vienna Summit in 1961. In April 1962, the Americans put nuclear missiles in Turkey. Also, in 1959, a rebel named Fidel Castro took power in Cuba, an island just 90 miles away from Florida. Before Castro took over, the government – led by Colonel Batista – had been a corrupt and right-wing military dictatorship, but the Americans had many business interests in Cuba. When Castro came to power, however, he nationalised American companies in Cuba. In retaliation, the Americans stopped all aid to Cuba, and all imports of Cuban sugar. This was a blow to Castro as sugar was the mainstay of the Cuban economy. Castro was forced to look to the USSR for help, and, in 1960, the USSR signed an agreement to buy 1 million tonnes of Cuban sugar every year. Castro, who had not been a Communist when he took power, became a Communist. America was alarmed. In April 1961, with Kennedy’s knowledge, the CIA funded, trained, armed and transported 1,300 Cuban exiles to invade Cuba. They landed at the Bay of Pigs and made an attempt to overthrow Castro. The invasion was adisaster, and President Kennedy was humiliated. In September 1961, Castro asked for – and Russia publicly promised – weapons to defend Cuba against America. Which is why on 14 October 1962, the Americans discovered the missile sites in Cuba. These sites brought every town in the US withinrange of Soviet nuclear missiles. President Kennedy called a meeting of the National Security Council and on 22 October went on TV to tell the American people that they were under threat.The crisis had begun. After the Bay of Pigs fiasco in 1961, the Kennedy administration banned all imports of Cuban products and won support from NATO allies to isolate Cuba economically. In early 1962, the Kennedy administration engineered the eviction of Cuba from the Organization of American States. Some in Congress were advocating an invasion of Cuba. In September 1962 the US Senate passed a resolution sanctioning the use of force against Cuba should it be necessary “to curb Cuban aggression and subversion in Latin America.” The resolution sanctioned force against Cuba to prevent the creation or use of “an externally supported offensive military capability endangering the security of the United States.” The vote was 85 to 1. Against Cuba, President Kennedy was supporting Edward Lansdale’s Operation Mongoose – a program of psychological warfare and designed to provoke, harass and disrupt – a program supported by the president’s brother, Attorney General Robert Kennedy. An operation called Dirty Tricks tried staged incidents. Hit and run saboteurs burned cane fields and blew up oil storage tanks in Cuba. More assassination attempts were made against Castro. At the Pentagon, the Joint Chiefs of Staff were skeptical about Operation Mongoose. For months they had favored an invasion. 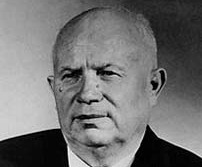 First Secretary Khrushchev. He appreciated Kennedy being sober-minded and not reckless. Fidel Castro agreed to the idea. In the US, congressional elections were coming up in early November (1962), and it was Soviet strategy to keep the delivery of the missiles secret until after the elections when they believed that Kennedy would be under less pressure to make a show of standing up to the Soviet Union. The shipping of rockets and nuclear warheads to Cuba began in secret. On October 14 a U-2 air reconnaissance flight over Cuba took photos that revealed what CIA photo analysts concluded were rockets that had been manufactured in the Soviet Union. On October 16 they informed President Kennedy and described the missiles as having a range of 1,174 miles and that after being made ready the missiles could hit Washington in thirteen minutes. The CIA told Kennedy they didn’t know when the missiles would be ready for launching, that this would depend on how soon nuclear warheads would be attached, and they told Kennedy that there was reason to believe that the nuclear warheads had already been shipped to Cuba. Kennedy was outraged. He thought he had an understanding with Khrushchev. Congressional elections were three weeks away. Former president Dwight Eisenhower had just described him as weak on foreign policy. Kennedy believed that Khrushchev’s actions would help Republicans and prevent his re-election in 1964. 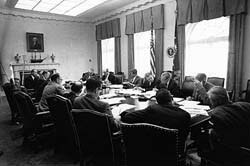 The White House Cabinet Room with President Kennedy and others responding to the missile crisis. What followed was the US stepping up its reconnaissance of Cuba with U-2 aircraft. The Joint Chiefs of Staff saw solution in the exercise of US military power and nothing according to Khrushchev’s or Cuba’s point of view. The US had a right to defend itself not only against an actual attack but also a potentiality, and they began arguing for an air strike. President Kennedy decided that eventually he would need “to take out those missiles.” Kennedy would not announce the crisis for six more days while his administration, the military and the CIA worked on the issue. Meanwhile, an emotional Robert Kennedy had urged his brother to approve a more aggressive sabotage effort against Cuba. He talked about blowing up a US ship anchored at Guantanamo,blaming it on Castro and using the incident as an excuse for invading Cuba. 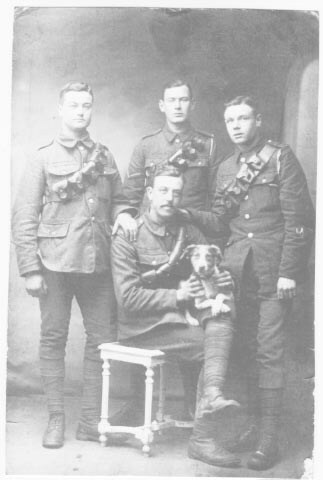 He was opposed to a surprise air attack. Referring to Pearl Harbor he said he did not want his brother to be seen as another Tojo (Japan’s World War II prime minister). 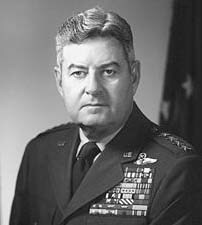 Curtis LeMay. He wanted war, won a depiction in the movie Dr. Strangelove and in 1968 became George Wallace’s vice-presidential running mate. Kennedy and others ignored LeMay. The blockade was to begin on Sunday, October 21. It was to be a “quarantine,” allowing Soviet ships to pass that were carrying goods such as baby food, goods deemed as not of immediate military value. Shipments of oil were to be allowed, a point not everybody agreed upon. Good evening, my fellow citizens. This Government, as promised, has maintained the closest surveillance of the Soviet military build-up on the island of Cuba. Within the past week unmistakable evidence has established the fact that a series of offensive missile sites is now in preparation on that imprisoned island. The purposes of these bases can be none other than to provide a nuclear strike capability against the Western Hemisphere. As Kennedy spoke, the US Air force was preparing for war. Around 200 bombers with nuclear weapons on board were being dispersed to airstrips across the nation. Security for people in the United States was dependent on its military completely wiping out the Soviet Union’s capability to hit the US with its nuclear weapons – a dubious capability. Otherwise, security for the Americans as well as people of the Soviet Union, was dependent upon the good measure, caution and emotional stability possessed by Khrushchev and Kennedy. An hour before Kennedy’s speech on Monday, a copy of his speech had been given to the Soviet Ambassador in Washington, and fifteen minutes later Khrushchev had a copy in his hands. Khrushchev ordered a heightened alert for the Soviet military, and to avoid a confrontation with the US Navy he ordered the two ships carrying missiles, theKimovsk and the Yuri Gagarin, to return home. Ships with non-military cargoes including an oil tanker were to proceed to Cuba. He wrote a letter to Kennedy, accusing him of pushing the world toward thermonuclear war. Kennedy established an Executive Committee of the National Security Council (ExComm) to deal with the crisis. It met in the Cabinet Room of the White House, and its discussions were taped. On Tuesday, the 23rd, US ships took up positions along a line 800 miles from Cuba. The naval blockade was traditionally an act of war, but the US public saw it as a step in defending the country. Like the Kennedy administration they allowed themselves the concept of defense. In a Gallup survey only 4 percent of Americans polled was opposed to the blockade. Eighty percent of those polled believed that the naval blockade would not lead to World War III. On Thursday, the 25th, ExComm continued discussing the need to take out the Soviet missiles by force. The greatest emergency troop mobilization since World War II was underway in preparation for a possible invasion of Cuba. It was eighteen months since the Bay of Pigs invasion and it was still not firm in Kennedy’s mind how the majority of Cubans would respond to what he considered liberation. Kennedy asked if there was any up-to-date intelligence reports on Cuban morale and support for Castro. Castro was expecting an invasion and looking forward to cutting down the invasion force in the water, a showdown he thought he could win with the help from the Soviet Union. People in the United States were virtually united in their opposition to what they saw as an enemy force threatening them and their nation, but Castro was mystified by what he saw in the US media. He saw the US media as underestimating the strength of Russian force in Cuba and he thought it was some kind of intentional deception. It was on Thursday, the 25th, that United Nations ambassador Adlai Stevenson confronted the Soviet Union at the UN Security Council meeting. He described the Soviet Union as having “secretly introduced [a] menacing offensive military buildup into the island of Cuba.” The Soviet ambassador, Zorin, was holding to the line of not admitting the existence of the missiles in Cuba, which disappointed Castro. He believed that the Soviet Union had nothing to hide in helping to defend Cuba. Well now, the quarantine itself won’t remove the weapons. So you only get two ways of removing the weapons: one is negotiate them out, in other words trade them out, and the other is to go in and take them out. I don’t see any other way you’re going to get the weapons out. Saturday, the 27th, was the most tense day of the crisis. US jets had been whizzing low over Cuba, taking photographs. Castro saw the flights as preparation for an invasion and a violation of Cuba’s territorial integrity. Early that day, ExComm received information that a U-2 plane in Alaska had flown off course over the Soviet Union’s Chukotski Peninsula, causing Soviet MiG fighters planes to scramble and US F-102 fighters with nuclear air-to-air missiles to fly to the Bering Sea. McNamara turned white and yelled, “This means war with the Soviet Union.” But, the U-2 flew back to Alaska before any shots were fired. On Saturday another letter arrived from Khrushchev. Unlike the previous letters, Khrushchev made this one public. It was broadcast on Moscow radio and published on the front page of the official government newspaper, Izvestia. The letter acknowledged the presence of Soviet missiles in Cuba. There was no longer reason for a denying it. On the back page of the same Izvestia issue was an article the paper had failed to remove. The article accused the US of making up a story about Soviet missiles in Cuba. It was, however, little noticed. The big story was Khrushchev’s condition for removing Soviet missiles from Cuba: Kennedy removing US missiles from Turkey. 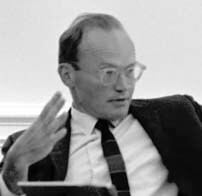 McGeorge Bundy, hawkish National Security Advisor to Presidents Kennedy and Johnson and defender of Johnson regarding Vietnam. The missiles in Turkey were seen by Kennedy as having low strategic value, given that missiles on US submarines now provided the same magnitude of threat. Robert Kennedy sided with his brother, not wanting war over “some obsolete missiles in Turkey.” But Kennedy’s National Security Advisor, McGeorge Bundy, clung to the psychological game aspect of national security. He described removing the missiles from Turkey as a loss of face and that it would weaken the US in the eyes of the nation’s NATO allies. The discussion was interrupted by news of a lost U-2 spy plane over Cuba. The US that Saturday morning had sent a U-2 spy-plane high over Cuba, and a Soviet missile in Cuba had shot it down, killing the pilot. It was done without Khrushchev’s approval. Khrushchev would tell his general in Cuba that he had acted too hastily by shooting down the U-2 at a time when an agreement with the US was emerging. For the time being, Khrushchev wondered whether Kennedy would be able to endure the humiliation of the loss of a spy plane without giving in to his military chiefs. It had been his view that Kennedy was a tool of the Pentagon, Wall Street and the military-industrial complex. Kennedy chose what LeMay called an “appeasement policy.” He had support from Britain’s Conservative prime minister, Harold Macmillan. Saturday evening, ExComm drafted a reply to Khrushchev’s letter, accepting his offer to remove missiles from Cuba. Kennedy met with a small group of advisors and agreed to send an oral message to the Soviet Union’s ambassador in Washington, delivered by his brother Robert, promising that the US would not invade Cuba and that the missiles in Turkey would be removed. And the following day, Sunday, Kennedy met with UN Secretary-General U Thant and consolidated the agreement. On Sunday, the 28th, Khrushchev received the message from Kennedy sent through the Soviet ambassador in Washington, and the message was discussed by Khrushchev and his fellow Presidium members. Khrushchev was impressed by what he thought was Kennedy having shown himself to be “sober-minded” and not reckless. He sent a personal letter to Kennedy and he announced over Radio Moscow that he had agreed to removed the missiles from Cuba. Kennedy and millions of others felt relief. It was a beautiful autumn morning in Washington. They would survive and civilization continue after all. CIA Director McCone saw it as a Soviet about face. Khrushchev sent a message to Castro advising patience and self-control. Khrushchev and his colleagues were opposed to a “beautiful death” and a glorious showdown with the US that Castro and Che Guevara had been advocating. He told Castro that “We aren’t struggling against imperialism in order to die.” Castro remained furious with Khrushchev, accusing him of having no cojones. China’s Mao Zedong joined in the criticism. The Sino-Soviet dispute was still on, and he denounced Soviet leadership for giving in to the US. In 1963, Mao would find fault with the Russians for signing the Nuclear Test Ban Treaty with the United States and Britain. Almost immediately after the Cuban Missile Crisis, a myth arose in the United States that Kennedy had won in an “eyeball to eyeball” test of wills with Khrushchev. The men who had been in the Kennedy administration – Dean Rusk, McGeorge Bundy and Robert McNamara – followed Kennedy’s assassination, in November 1963, into the administration of Lyndon Johnson. And from the Cuban Missile Crisis they were encouraged by what they viewed as their power at control in an eye-ball to eye-ball test of wills, and they would apply their optimism to a new area: Vietnam. 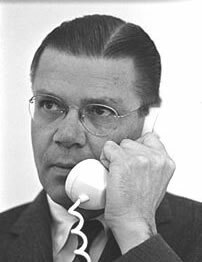 Years later, Robert McNamara was to describe Vietnam as a mistake and was also to say that had we known that nuclear warheads were already in Cuba we may have attacked.